Do you have an author that you love? You know, that one (or two or three…) author(s) who never let you down because every book they write is delightful. There is a pair of writers that I simply adore; whenever they write a book together I know I am going to love it. Rachel Cohn and David Levithan just do it for me. 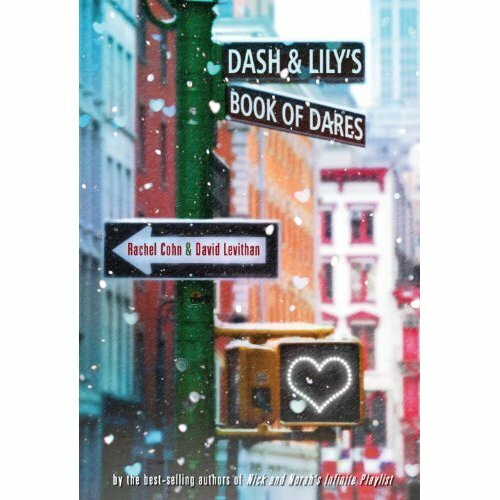 I was first introduced to them through Nick & Norah’s Infinite Playlist (later made into a movie of the same title), continued to love them through Naomi & Ely’s No Kiss List and was so happy they didn’t let me down in their newest book, Dash & Lily’s Book of Dares. They write these books in a pretty unique way – Rachel writes the girl chapter then sends it to David. He writes the boy chapter then sends it to Rachel. They keep going until the book is finished. Doesn’t that make you want to do that with a friend?! There are so many reasons their work brings me joy (both together and individually) – their writing voices, the rich settings (often NYC), the fact that they don’t dumb things down because they write for teens (that is super annoying when it happens with other authors) and well-developed characters. It is so satisfying to read a book where the characters truly feel like people you might actually know or meet. Dash & Lily’s story begins with a red notebook left on the shelf of a bookstore for just the right person. The notebook belongs to Lily and Dash finds it but, it remains to be seen if he is that right person. Set against the backdrop of New York City during the winter holidays, Dash and Lily’s story plays out as they pass the notebook back and forth, starting with dares then moving to secrets and dreams they’ve never shared with anyone else. When they finally meet face to face will they live up to the person they are in the notebook? Dash & Lily’s Book of Dares comes out on October 26th but you can put it on hold now. This entry was posted in Author, News, Read This! and tagged Book Review, Book Reviews, favorite author on October 13, 2010 by pushtotalkteens.